Using their authority over screening passengers on the train as a guise, MPS railway personnel in on the scheme actively pursue exchange deals in main border towns such as North Hamgyong Province’s Rason and North Pyongan Province’s Sinuiju. Each day, Pyongyang-based railway cadres pick out four members who are known to be good at nabbing these deals and put two as a team on the Pyongyang-Sinuiju (trains no. 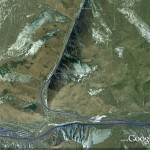 5, 6) and Pyongyang-Duman River (trains no. 7, 8) trains, so they can exchange money, according to the source. This one example among many of state personnel benefit from informal economic activity, through their official roles. It often makes little sense to talk about the market versus the state, as if they were two wholly separate entities. The North Korean railway system, a popular form of public transportation, is the latest mechanism through which the authorities are raking in profits. Railway officials are charging more than 100 times the regular state price for tickets on the most popular routes– a move specifically targeting the donju [new affluent middle class] and their money. He went on to explain that diesel engines, free from reliance on electricity, allow trains to depart and arrive on time despite shortages in power. Needless to say, this reliable option is extremely popular, particularly among those reliant on them to do business, which the railways are using to their advantage by charging exorbitant fees for their services. The 7~8 train, which runs from Pyongyang to the Tumen River, was originally an international express bound to Russia, while the 9~10 train transported civil servants to various locations for international business trips. The 23~24 train, however, is the most widely used train in modern North Korea, designated specifically for business purposes since the proliferation of market activity at the start of the 21st century. 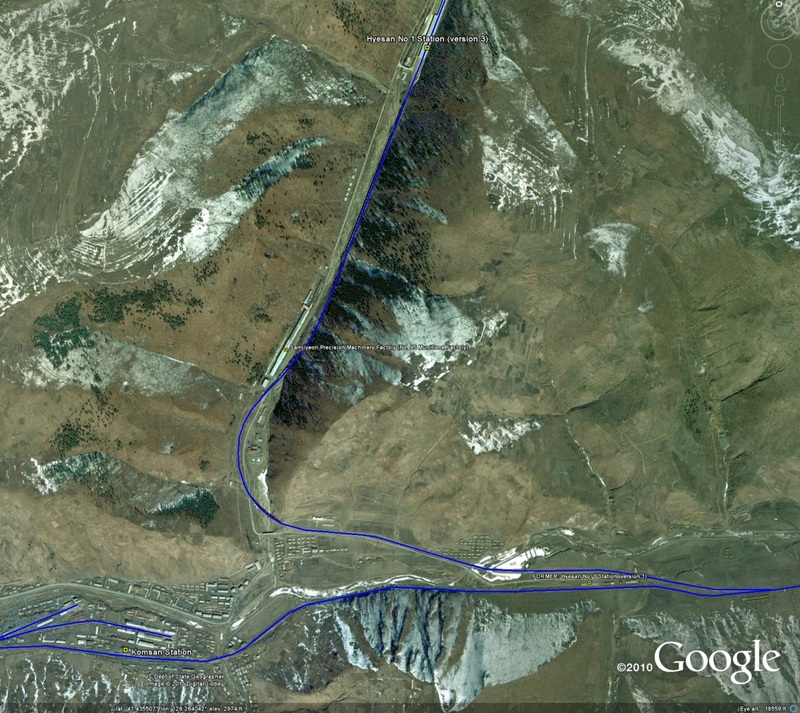 Pictured above (Google Earth): A map of the Khasan-Rajin Port rail service. Russia appears to be preparing for a test operation of its newly renovated railway linked to North Korea, but the economic feasibility of South Korea’s joining the logistics project remains to be seen, a Seoul diplomat said Wednesday. The project is part of Russia’s ambition to set up a rail road linking Asia to the Eurasian region. Last year, South Korea agreed with Russia to extend the track to South Korea. Seoul officials said that they may be able to finish linking the rail to South Korea’s southern port city of Busan and put it into operation as early as next year, but experts have said feasibility of the plan remains to be seen. RUSSIAN Railways (RZD) has commenced testing of freight traffic on the reopened link from the Khasan border station of the Trans Siberian Railway in western Siberia to the port of Rason, North Korea. Two freight trains consisting of 65 wagons containing Kuzbass coal are taking part in the trials, which are intended to test the recently redeveloped railway infrastructure, as well as customs practices and freight handling at the port. The project is being carried out by the RasonKonTrans joint venture, which was formed in 2008, and is held by RZD Trading House (70%) and the port of Rason (30%). Work involved the reconstruction of the Tumangang – Rason railway in North Korea, which included the introduction of 54km of dual-gauge (1520mm and 1435mm) track, as well as the reconstruction of 18 bridges, 12 culverts, and three tunnels with a total length of more than 4.5km. The railway was officially opened on September 22, 2013, and was funded through RasonKonTrans’ authorised capital and loans. The joint venture has also invested to improve capacity at the port, including the addition of connecting tracks, dredging and construction of a new quay wall. RZD says the project will attract additional traffic to the Trans-Siberian Railway, with around 4 million tonnes of freight expected to use the Khasan – Rason link per year. “The company has started to provide a full suite of services to ship coal through Rajin to Asia-Pacific countries,” said a statement from Russian Railways logistics subsidiary, RZhD Logistika. A joint venture between Russian Railways and the North Korean Ministry of Railways has rebuilt one of the port’s wharfs and a rail link connecting it to Russia in a rare example of foreign involvement in the economy of the isolated dictator state. The joint venture, RasonKonTrans, where Russia holds 70 percent, sought to relieve the congestion at Russia’s Pacific ports. The Russian terminal at Rajin, Asia’s most northerly all-year ice-free port, will at first handle just coal freight from Russia to ship it further to China’s eastern and southeastern provinces. Further plans are to equip it to be able to provide container services. RZhD Logistika loaded a total of 9,000 metric tons of coal on two freight trains of 130 cars each to carry to Rajin at the end of last month, it said in the statement. The cargo will next go to China’s ports of Shanghai, Lianyungang and Guangzhou. Russia’s biggest coal export port, Vostochny, which sits on the Pacific coast, has the capacity to handle 18 million tons a year, Malysheva said. It and the other key coal port of Vanino operate at the top of their capacity, as exports of the fuel to Asia have increased, she said. Even so, the government last week backed a plan to boost development of the coal-mining industry in the country’s Far East to cater to Asian markets. The idea is to have a shorter transportation leg for the shipments, compared with the distance that the coal travels from Siberia. This Russian-language source has additional information. The Rajin-Khasan railway section has been successfully rebuilt in line with the DPRK-Russia Moscow Declaration, signed in August 2001. The section was opened for service on Sunday. Its opening serves as a landmark in promoting the friendly and cooperative relations between the DPRK and Russia, strengthening the economic and cultural ties in the Asia-Pacific region and ensuring the common prosperity of regional countries. In the first year of the new century, historic meeting and talks were held between Kim Jong Il, leader of the Democratic People’s Republic of Korea, and V.V. Putin, president of the Russian Federation, resulting in the adoption of the DPRK-Russia Moscow Declaration. The declaration expressed the will of the two countries to make every possible effort to carry into practice a plan for opening railway transit linking the DPRK, Russia and Europe. Such plan was the first phase for wide-ranging cooperation between the two countries, which came under spotlight of the world. At that time some forces criticized the plan as a “daydream”, displeased with significant cooperation between the two countries as well as peace and prosperity of the Korean Peninsula. However, the project plan went into practice in October 2008 on the eve of the 60th anniversary of the establishment of the bilateral diplomatic relations thanks to the unshakable will of the two countries and the active cooperation of their railway workers. At the ground-breaking ceremony for the project, which was held in front of the DPRK-Russia Friendship Pavilion in the area of Tumangang Railway Station in Rason City, V. I. Yakunin, president of the Russian Railways Company, said that the world would soon witness the longest railway transit, extending more than 10 000 km, through which 100 000 containers would be transported annually from 2013. At last, the Rajin-Khasan railway section has been successfully rebuilt this year marking the 65th anniversary of the establishment of diplomatic relation between the DPRK and Russia. This would bring a large-scale cooperation project between the two countries into practice, ensuring their and regional development and interests. The railway section from Rajin to Khasan will be helpful to the economy, transport service and people’s wellbeing of the two countries. It can also develop into an international transit between Asia and Europe. The facts show the vitality of cooperation documents of the two countries, including the DPRK-Russia Moscow Declaration, and the noble idea carried in them. The friendly and cooperative relationship between the DPRK and Russia will grow stronger with the geopolitical importance of Northeast Asia. Choson Exchange offers additional detail and other news from Rason here. Rajin-Khasan railway section has been successfully rebuilt and opened for service with due ceremony in Rajin on Sunday. The opening of the section will greatly contribute to developing the friendly and cooperative relations between Russia and the DPRK. Present at the ceremony from the DPRK side were Jon Kil Su, minister of Railways, O Ryong Chol, vice-minister of Foreign Trade, Ri Chol Sok, vice-chairman of the State Commission for Economic Development, Jo Jong Ho, chairman of the Rason City People’s Committee, Im Chon Il, consul general of the DPRK to Nakhodka, officials in the field of railways and people in Rason City. Present there from the Russian side were V. I. Yakunin, president of the “Russian Railways” Company, Alexei Tsijenov, vice-minister of Transport, Sergey Sidorov, first vice-governor of the Maritime Territory Administration, Alexandr Timonin, Russian ambassador to the DPRK, Vyacheslav Tsupikov, consul general of Russia to Chongjin, and Russians including those concerned with the railways. Diplomatic envoys to the DPRK also attended. V. I. Yakunin in the opening ceremony said the section has opened for service under Russia-DPRK Moscow Declaration signed by the top leaders of the two countries in 2001. To press for the renovation of the railways running through the land of Korea will be of great contribution to the development of economic cooperation in the Asia-Pacific region in the future, he stressed. Minister of Railways of the DPRK in his speech said that the plan of linking DPRK-Russia railways serves as a model of wide-ranging bilateral cooperation which meets the common progress and interests of the two peoples. He expressed the conviction that the operation of the opened railways section will be successful as it was made on the principle of mutual respect and cooperation between the railway transportation fields of the two countries. The ceremony ended with the playing of national anthems of the two countries. It was followed by a reception. After years of work to directly connect railway tracks between Russia and North Korea, a 54-kilometer section linking border areas of the two countries reopened Sunday with a ceremony in Rason, a special economic zone in northeastern North Korea. A special train carrying a group of reporters arrived at Rajin Port in Rason from Khasan in the Russian Far East, making it the first train to travel between the two countries without changing bogies at the border. Trains had traveled on the section since the Soviet era. But given differences in track width between the Russian side and the North Korean side, workers had to change bogies every time a train crossed the border. With the end of overhaul work, North Korea appears poised to promote the development of its special economic zone, while Russia seeks to revitalize the Trans-Siberian Railway by linking it, in the future, to a railway system that would run through the Korean Peninsula. In 2008, the two countries started work to lay Russia-sized railway tracks from the Russian border area to Rajin Port after Russian President Vladimir Putin and then North Korean leader Kim Jong Il agreed in August 2001 to directly connect the two railway systems. Moscow shoulders 70 percent of 8.3 billion ruble, or 25.8 billion yen, in costs to lay the new tracks and build the North Korean port, while Pyongyang covers the remainder. The two countries conducted a trial run on the section using a freight train in October 2011. They initially planned to launch commercial runs in autumn last year, but the plan was delayed until now. Initially, the 54-kilometer (33-mile) line will transport Russian coal to markets in the Asia-Pacific region, OAO Russian Railways Chief Executive Officer Vladimir Yakunin said at the ceremony in Rajin. The second phase of the project will involve the construction of a container-handling facility and potentially an oil terminal at the North Korean site, he said. “Our common objective is for this link and port to be a pilot scheme for the restoration of a single transport system in North and South Korea that would link the peninsula to countries that gravitate to this region, to Europe via Russia,” Yakunin said. The CEO said he hopes the plan will help promote peace between the two Koreas, which remain technically at war following the conflict 1950-53 that divided the countries. The route is part of a larger project, dubbed the Iron Silk Road, that would connect Russia’s Trans-Siberian Railway to South Korea via the North for an overland route cutting transportation costs to Europe. Success depends on improved ties between South Korea and its isolated Communist neighbor. Yakunin said the railway and container terminal, a project worth 9 billion roubles ($283 million), would work at a capacity of 4 million metric tons a year within two years. Practical implementation of the project began in 2008, when RZD and North Korea’s Ministry of Railways signed a cooperation agreement. In October of that year, Tumangan station saw the ceremonial laying of the first link of the rails and sleepers that marked the beginning of the reconstruction of the Khasan – Rajin railway section. In 2009, a joint venture, RasonKonTrans, was set up by Russian Railways Trading House, a subsidiary of RZD, and the port of Rajin, in order to implement the project. 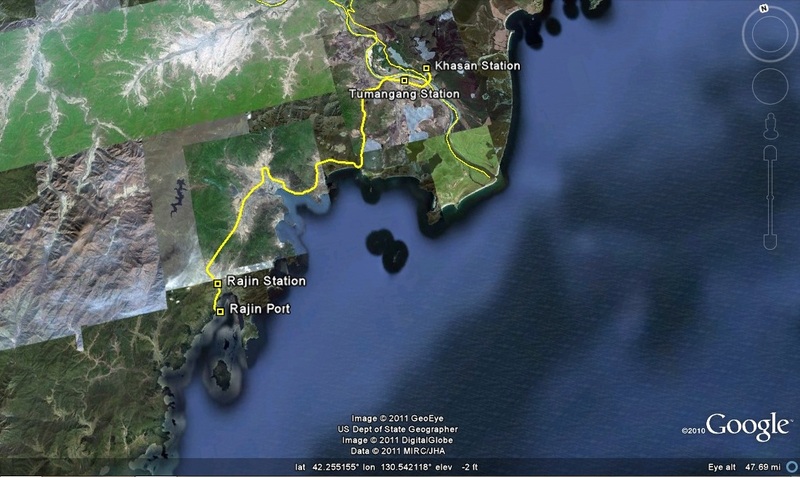 RasonKonTrans has in turn concluded a 49-year leasing arrangement of the railway line between Tumen – Rajin with the Donghae company of North Korea’s Ministry of Railways. The work was financed from RasonKonTrans’ share capital, as well as by funds the joint venture was able to borrow based on the project’s business plan. More than 5.5 billion roubles had been invested in the reconstruction of the Khasan – Rajin railway line and 3.5 billion roubles in the port terminal. Officials from both countries say they are working together to finalise the timetable and the joint regulations which will govern the movement of trains on this section. To ensure the interoperability of the new line with both North Korea’s railway network and the Russian rail network, there are plans to create a single control centre with the participation of experts from the RasonKonTrans joint venture and the Donghae transport company of North Korea’s Ministry of Railways. Talks in Moscow between Vladimir Yakunin, President of Russian Railways, and Jeong Gil Soo, North Korea’s Minister of Railways (MOR) agreed the final details on the Khasas-Rajin link. The project is being implemented in accordance with agreements reached in 2000 by Russian President Vladimir Putin and then North Korean leader Kim Jong Il. It is linked to cooperation between the two countries and forms part of a project to restore traffic on the entire Trans-Korean Main Line. ‘Over the long term, this will allow most traffic between South Korea, Europe, Russia and the CIS countries to be sent by rail by the Trans-Siberian Railway,’ said one report. The new agreement allows for a single control centre ‘with the participation of experts from the joint ventures RasonKonTrans and ZHTK Donghae MOR from North Korea to handle traffic management and facilitate collaboration with the entire railway network in North Korea. The parties also agreed to develop instructions for the movement of trains and a train timetable’, stated RIA Oreanda. The project involves reconnecting the combined dual-track railway with 1520 mm and 1435 mm gauges on the stretch from the Russian border to the port of Rajin in North Korea, a distance of 54 km. This includes the reconstruction of three tunnels, the repair a border railway bridge and construction of a freight terminal with an annual capacity of 4 million tons at Port Rajin. The report continued:’The project is being implemented by the joint venture RasonKonTrans, which was specially set up in 2008 and is owned by OAO RZD Trading House and the port of Rajin. ‘The stretch between Rajin and Tuman stations is estimated at 99.8% complete. Work on commissioning the signalling, centralisation and blocking equipment has been completed along the entire section with the exception of Rajin station. ‘The tunnels are now fully ready. As of mid-May 2013, all the work to replace the timber on the Korean border bridge ‘Friendship’ has been carried out. Currently, work is underway to finish the bridge and install the railing. ‘At the port of Rajin, concrete is being laid and building foundations are being installed at the administrative and amenity building, repair shop and spare parts warehouse, work has begun on laying and ballasting the railway lines within the terminals and utility lines are being laid. ‘Equipment continues to be installed at the harbour wall. Work on installing outdoor lighting and fencing the port terminal’s territory is also ongoing’. Pyongyang, April 2 (KCNA) — A Rajin-Khassan cargo train service will run from October this year. Kim Chang Sik, a department director of the DPRK Ministry of Railways, told KCNA that the laying of railroad and renovation of railway stations, tunnels and communications facilities are now under way in the section. In line with the declaration, a cooperation agreement between the DPRK Ministry of Railways and the Russia Railway Holding Corporation was concluded in April 2008 to be followed by an agreement on joint venture between Rajin Port and the Corporation. A contract on the lease of the Rajin-Tumangang railway was made between the Ministry’s Eastern Railway Ryonun Company and the Rason International Joint Venture Container Terminal, under which the 54 km-section has been rebuilt into a mixed track from October 2008. A trial train service took place in October 2011 between Rajin of the DPRK and Khassan of Russia. At least 100,000 containers will be yearly carried along the line. This section will serve as an international railway container transport line linking Northeast Asia with Europe. KCNA also offered this video. North Korea and Russia will start a cross-border cargo train service in October, Pyongyang’s state media reported Monday, in a move that could make a North Korean port a regional hub for Europe-bound shipments. The announcement came more than three years after the two countries launched a project to rebuild two rail lines between Russia’s Far Eastern border town of Khasan and North Korea’s northeastern port city of Rajin. The North designated Rason, which includes the Rajin port, as a special economic zone in 1991 and has since striven to develop it into a regional logistics hub close to both China and Russia. In October, North Korea and Russia held a test run on the 54-kilometer-long railway line. The proposed cargo service can handle 100,000 shipping containers each year, the North’s official Korean Central News Agency said in a dispatch. The renovation project, if completed, will offer a new route of container transportation between Northeast Asia and Europe, the dispatch said, and could significantly reduce shipping time and costs. The freight service could also help boost relations between North Korea and Russia, including their economic cooperation, the dispatch said. The trade volume between North Korea and Russia stood at US$110 million in 2010, the latest year for which statistics are available, according to South Korea’s state-run Korea Trade-Investment Promotion Agency. Russia maintains friendly ties with North Korea, though its leader Dmitry Medvedev has strongly denounced North Korea’s rocket launch set for sometime between April 12 and 16. Medvedev made the remarks during summit talks with South Korean President Lee Myung-bak in Seoul last month on the sidelines of an international nuclear summit, according to Lee’s office. 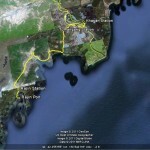 A source in Yanggang province reported May 4th, “A Hyesan – Pyongyang train derailed on May 2nd somewhere in the region of Geomsan station in Hyesan killing at least ten passengers and injuring many others.” The injured are being treated at a nearby hospital but the dead have not been formally identified and are yet to be transferred home. “The North Korean police and security agencies are both investigating the case,” said the source. “So far they have been unable to establish the incident’s cause.” They are said to be investigating the possibility that a track sleeper became unhinged. The possibility, however, that this is not merely an accidental occurrence is raised by the fact that the Pyongyang – Hyesan line is known by the population not just to be a route used by citizens travelling between the cities but is also one of national significance. There are both a security agency detention center and a munitions factory in the Geomsan area of Hyesan. Before he died Kim Il-sung travelled only via station number 1 at Geomsan. Five of twelve passenger carriages were overturned when they became disconnected from a connecting link. Subsequent repair operations have caused much disruption to regular line service. Stranded passengers are staying in the station’s vicinity as locals take advantage of the situation, catering to them with impromptu vending operations. Last week, world media reported that two key North Korean officials were executed a few months ago. One was Kim Yong-sam, the former minister for railways. Reportedly, he was held responsible for a mysterious explosion that in 2004 wiped out the entire railway station of Ryongchon a few hours after the armored train of Dear Leader Kim Jong-il had passed through – a suspected assassination attempt. The other North Korean official was Mun Il-bong, the finance minister. His alleged crime was the inability to handle the currency reform that in late 2009 nearly brought the North Korean economy to a complete standstill. This news was first broken by the major South Korean newspaper Chosun Ilbo, which cited its North Korean sources. The newspaper has good connections among the North Korean refugee community, whose members are in touch with officials in North Korea. These reports were widely discussed in the media, and produced the usual wave of speculation about supposed factional disagreements in the North Korean leadership. However, such speculation might be premature. There is no way to verify with sufficient confidence whether the alleged executions actually took place. We do not know – and, in all probability, are not going to know anytime soon – whether the North Korean ex-ministers indeed met their ends. Those who do not deal with North Korea seldom realize how little outside observers know about its high politics. North Korean media stretch the definition of state secret to an extent that would likely appear excessive even to Joseph Stalin. There have been numerous cases where North Korean media chose not to report some very important (and, interestingly, very public) events that had a profound impact on the lives of every North Korean. For example, the 2009 currency reform which, if the above-mentioned reports are to be believed, led to the lethal downfall of Mun Il-bong, one of its major planners. Generally speaking, the reform emulated the Soviet currency reform of 1947 that for decades has served as a prototype of currency reforms in all communist countries. There was an important difference, though. In 1947, all major Soviet newspapers ran lengthy front-page stories about the currency reform, extolling its timeliness and explaining the need to improve the lives of the good common Soviet citizen by wiping out the ill-gotten cash holdings of shameless profiteers. In 2009, no North Korean media even mentioned the planned reform, which was by far the most important news of the time and had a dramatic impact on the lives of every North Korean. Information about the changes and their conditions was delivered via public notices pinned to the doors of banks, as well as through confidential messages to local authorities. Foreign embassies were notified by a short official letter. Finally, the Pyongyang-sponsored Korean newspaper in Japan ran a couple of stories about the reform. But mainstream media within North Korea remained completely silent about the dramatic upheaval. Those who keep a track of North Korean affairs might remember the so-called “July 1 reforms” of 2002. These were once heralded (wrongly, as it turned out) as a sign of Pyongyang’s willingness to emulate the Chinese reformist policy. Few people are aware, though, that North Korean media first mentioned the ongoing reform in September, a few months after its launch. This is especially relevant in regard to promotions and demotions, as well as purges and persecution of the regime’s top officials. The North used to stage open show trials in the 1950s, but this Stalinist tradition was discarded. In subsequent decades, disgraced officials simply ceased to be mentioned in media and disappeared from the public view, so the general public – including the lower reaches of the elite – could only guess the reasons behind the sudden disappearance of some powerful minister or, say, a Central Committee secretary. The disappearance of a dignitary is nearly always interpreted as a sure sign that he or she has been purged. The North Korean public inevitably starts to circulate a rumor that the hapless official was not just removed from office, but arrested or even executed. After some time these rumors reach foreign media, often through the North Korean refugee organizations that have good networks inside the North. Consequently, the world’s media run another story about a North Korean minister who was allegedly executed for his wrongdoings or as a result of alleged factional strife. Very often, impressive details are added – for example, it is frequently stated that the alleged execution was public or, at least, held in the presence of other top dignitaries (as a matter of fact, the present author has never seen any reliable evidence of a public or semi-public execution of a former dignitary – this type of brutal show seems to be reserved only for humble folks). There have been a number of cases, to be sure, when these rumors were eventually confirmed. For example, we now know for certain that the state security minister Kim Pyong-ha, who disappeared in 1982, was either executed or committed suicide during his arrest (his downfall was followed by a large-scale purge of the North Korean secret police). There is little reason to doubt that So Kwang-him, the party secretary for agriculture, was indeed executed in 1997. The aging bureaucrat was accused of espionage and subversion. The charge was that he had deliberately ruined the North Korean agriculture sector and provoked a disastrous famine, being on the payroll of the US Central Intelligence Agency and other foreign intelligence agencies. However, things are not that simple. There have been numerous cases when prominent dignitaries first disappeared and were universally believed to be arrested and executed – but then made a comeback and re-entered North Korean politics. A good example of such political resurrection is the fate of Pak Chong-ae, a Soviet Korean who was dispatched to Korea for intelligence gathering and subversion in the early 1930s. After 1945, she became a prominent member of the North Korean leadership. Unlike a majority of Soviet Koreans, Pak Chong-ae survived a mass purge of pro-Soviet elements in 1956-1961, but suddenly disappeared in 1985. At the time, everybody, including the Soviet diplomats, were certain that she had been shot or probably died in prison – and this is what the rumors confidently told. However, in 1986, Pak Chong-ae re-emerged in the Korean political scene, albeit in secondary roles. Even more interesting is the case of Ch’oe Kwang, a former chief of staff. Ch’oe Kwang disappeared in 1969, and rumors held that he was shot soon afterwards. This was hardly the case, since in the late 1970s, Ch’oe Kwang first appeared in secondary positions, then re-launched his career and in 1988 was again appointed chief of general staff! So how should one treat the reports about the execution of Kim Yong-sam and Mun ll-bong? With caution. There is no reason to reject the reports completely – they might indeed be true. There is no doubt that rumors about the execution of ex-ministers are now circulating widely among North Korean officials. The 2009 currency reform was indeed a disaster, arguably, the worst prepared currency reform in the entire history of communist countries. The 2004 Ryongchon explosion also was an exceptional event, irrespective of whether it was an assassination attempt targeting the Dear Leader, or a result of bad luck and remarkable negligence. Therefore, one may well expect the severe punishment of people who were responsible for both disasters. However, the experiences of previous decades demonstrate that such rumors be taken with healthy skepticism. Incidentally, about a year ago, rumors persisted that another high-ranking official, the head of the party finance department, Pak Nam-gi, had been executed for his alleged mishandling of the currency reform. This story was universally believed, but so far no definite evidence of his sorry fate has emerged. To complicate things further, a few weeks ago a well-informed defectors’ group reported that Pak Nam-gi, alive and well, was spotted in Europe where he is managing the personal funds of the Kim family. So, is Pak Nam-gi dead, with all his family shipped to a prison camp? Or is he running a multi-billion dollar business from a North Korean embassy in Switzerland? We know not. But this is another reminder of the many uncertainties a North Korean watcher has to deal with. So, the rumors (and rumor-based reports) about Kim and Mun’s execution may well be true, but at the moment it is virtually impossible to talk about this with certainty. Things will become clear eventually, but this will happen, probably, only after several years. Sooner or later some relevant documents will be leaked. Even before that, some trustworthy witness of their execution will emerge. It is also possible, though, that one day the allegedly executed ex-ministers will reappear, alive and healthy for their advanced age. However, by that time this entire story will be of greater interest for historians, not journalists or policy analysts. Kim Yong-sam was accused of leaking information about the timetable of the train, which was returning from China. Kim Jong-il’s travel itineraries are known only to his personal guards and secretaries and the railways minister. Mun, who was finance minister between 2000 and 2008, apparently took the fall for the botched currency reform alongside then director of the Workers Party’s Planning and Finance Department Pak Nam-gi. The regime executed Pak by firing squad on the same charges in April last year. “It seems Mun was executed because public discontent got worse even though, unlike Pak, he had nothing to do with the actual preparations for the currency reform,” the source said. Regarding the suspected fate of Kim Yong-sam, I find it odd that the DPRK would execute him six years after his alleged offense. There are only a couple of reasons I can guess as to why the situation was handled this way: 1. If he was executed, he was executed for another reason, 2. If he was executed too soon after the April 2004 explosion, it would cast doubt on the DPRK’s official claim that the Ryongchon explosion was caused by an accidental train collision rather than an internal conspiracy to eliminate the leader. UPDATE: A reader (in the comments) reminds me that Kim Yong-sam’s demise was also reported in the media back in July 2010. At the time, his punishment was due to his failure to maintain locomotive trains that had been in store for wartime. So maybe his death has nothing to do with Ryongchon at all but a failure to carry out his duties. Regarding the execution of Mun Il-bong: The DPRK allegedly executed Pak Nam-gi over the currency reform in early March 2010. If Mr. Mun shared the same fate three months later, then the number of public officials executed over the country’s disastrous currency reform now stands at two. 1. Last I heard, Jon Kil-su is the DPRK’s Minister of Railways, being named just before the last SPA elections. 2. Here are satellite images of Ryongchon from before and after the explosion. Most of these can now be seen on Google Earth. 3. The story above mentions a purge in the munitions industry, but Kim Jong-il recently praised their efforts. 4. The Daily NK and Yonhap also reported on this story. Former North Korean Railways Minister Kim Yong Sam was executed in March last year for failing to maintain locomotive trains that had been in store for wartime, Radio Free Asia, a nonprofit radio station, reported Wednesday on its Internet edition. A source on North Korean affairs said Kim got into trouble during an inspection by the National Defense Commission for scrapping locomotive trains that were in store for wartime. After the inspection, carried out after celebrations were held to mark the country’s 60th birthday on Sept. 9, 2008, Kim was handed over to the State Security Department, report said. He had been railways minister for 10 years from September, 1998. A nationwide campaign is underway recently in North Korea to get rid of photos and publications of executed former senior officials, Radio Free Asia claimed Tuesday. This campaign was ordered by leader Kim Jong-il on July 2. The North’s Press Censorship Bureau is reportedly destroying documents and materials collected from across the country. According to RFA, the campaign’s targets include Pak Nam-gi, the former director of the North Korean Workers Party’s Planning and Finance Department who was executed in March over the disastrous currency reform, and former railways minister Kim Yong-sam. “Railway workers suffering from the food shortage stole copper and aluminum parts from locomotive trains that were in store for wartime and sold them as scrap metal. As a result, about 100 locomotives were scrapped,” it claimed. “This was revealed in an inspection by the National Defense Commission in 2008.” Kim Yong-sam was then taken to the State Security Department and executed in March the following year, it added. Kim Yong-sam was appointed railways minister in September 1998 but has not been seen in public since October 2008, when he was replaced by current minister Jon Kil-su. Pyongyang, April 9 (KCNA) — Deputy Pak Su Gil, vice-premier and minister of Finance, delivered a report on the results of the implementation of the DPRK state budget for last year and its state budget for this year at the 2nd Session of the 12th Supreme People’s Assembly held on Friday. According to the report, the state budget for last year was successfully implemented and, as a result, the state budgetary revenue was overfulfilled 1.7 per cent, an increase of 7 per cent over the previous year. Ministries, national institutions, management bureaus and complexes overfulfilled the national plans for budgetary revenue and all provinces, cities and counties across the country also overfulfilled their plans for local budgetary revenue. Last year’s plan for state budgetary expenditure was carried out at 99.8 per cent. An investment from the state budget was focused on the development of metal industry while a huge financial allocation was made for the power and coal industries and the railway transport. 8.6 per cent more funds than the previous year were spent for capital construction and expenditure was increased for agriculture and light industry. A 7.2 per cent greater financial disbursement than the previous year was made for the field of science and technology, surpassing the level of the latest science and technology in domains of space technology, nuclear technology and CNC technology and putting the key industries of the national economy on a high scientific and technological basis. A large amount of fund went to the field of cultural construction and 15.8 per cent of the total state budgetary expenditure was spent for national defence. The reporter said that the scale of revenue and expenditure in the state budget for this year has been set on the principle of improving the people’s standard of living to meet the requirements of the policy of the Workers’ Party of Korea on conducting a great offensive to bring about a decisive turn in the above-said work. This year’s plan for state budgetary revenue is expected to grow 6.3 per cent over last year. The revenue from the profits of state enterprises, the main source of state budgetary revenue, is expected to go up 7.7 per cent over last year, that from the profits of cooperative organizations 4.2 per cent, that from the fixed asset depreciation 2.5 per cent, that from real estate rent 2 per cent and that from social insurance 1.9 per cent. This year’s plan for state budgetary expenditure is expected to show an 8.3 per cent increase over last year. The spending for the light industry is expected to go up 10.1 per cent, that for agriculture 9.4 per cent and that for metal, power and coal industries and railway transport 7.3 per cent as compared with last year. The expenditure for the machine-building industry is expected to go up and an 8.5 per cent bigger financial allocation will be made for scientific researches and the introduction of new technologies. A 6.2 per cent bigger financial disbursement than last year is expected to be made to more successfully enforce the popular policies, a proof of the advantages of Korean-style socialism centered on the popular masses. 15.8 per cent of the total state budgetary expenditure for this year is expected to be spent for national defence. It is expected that a large amount of educational aid fund and stipends will be sent for the children of Koreans in Japan this year, too. In order to successfully implement this year’s state budget, all domains and units of the national economy should work out enterprising and realistic business strategy and management strategy and tenaciously carry them out by relying on a high degree of mental power of the producer masses and thus fulfill the plans for budgetary revenue without fail, stressed the reporter. North Korean leader Kim Jong-il can freely dispose of 20 percent of his country’s budget, a former secretary of North Korean Workers’ Party has said that. Hwang Jang-yop told the Asahi Shimbun, “Only 30 percent of the budget is spent on public services, while 50 percent is earmarked for military spending.” Hwang defected to South Korea in 1997. Hwang was interviewed by the daily during his visit to Japan on April 4-8. “Kim Jong-il’s dictatorship is 10 times worse than his father’s. People have a painful life,” he said. You are currently browsing the archives for the Ministry of Railways category.